This past weekend, I ventured out to the old confines of the Alfred J Loos Stadium in Addison, Texas. The event was to decide which gridiron team would go on to Los Angeles for the annual championship of their respective 2015 season. It pitted the visiting Surge of San Diego against the hosting Elite of Dallas. One quick side note: if a team name is meant to represent something on which that city is based, is there any doubt what “Elite” means for this Dallas squad? Yes, that was a silent nod to “America’s Team.” My apologies to the REST of the football nation. As is customary, at least for ME, I arrived to the game early. If there is a distinctive term for being earlier than early, then this would be the time and place to use it. As it happens, a friend and former classmate of mine (from American Broadcasting School) would be gearing up for this match, as a piece of the defensive front for Dallas. She had already properly warned me on Facebook that “I wasn’t ready for this kind of action!” It was merely a friendly taunt, yes, but would a player on just any ordinary football team say such a thing? I hasten to wonder, but can only achieve an unclear, ambiguous response. Clarity and ambiguity aside, it did not take long for me to realize that when the pads and helmets are thrown on, all I see is a football player. At the onset of the warm-ups, the two teams defined themselves for what the outcome of the big game would ultimately be: one team was quiet and uninspiring to watch, and the other was loose and enthusiastic. If you ever get to see any pregame warm-ups, do not neglect what your instincts would tell you about each and every player on their respective teams. As I once heard Robert Parish say in his prime with the Boston Celtics of the 1980s, they often could sense whether a team was ready to win or lose just based on how they looked when they were warming up on the court right before the game. If you know anything about the Celtics of that era, then you can imagine what the results were about 90% of the time. The fans, in decent numbers for the Dallas faithful, were exuberant and undaunted. Even when the San Diego Surge took a 14-8 lead into the 2nd quarter and marched down the field for a potential double-digit lead, they never seemed to lose their confidence, nor did the Elite players on the field. What looked like an overmatched defense in the early goings for Dallas quickly tightened like a vice grip midway through the game. By halftime, it was 22 all and in the 3rd quarter, Dallas gained a 28-22 advantage. Some questionable penalties attributed to the Elite offense, often times negating a large gain or even a touchdown to widen the lead, kept San Diego just within striking distance. As the 4th quarter was set to begin, I overheard the rowdy bench of the Dallas Elite echoing what I can only assume is a routine chant in such situations: “We all we got! We all we need! We all we got! We all we need!” Did they know they were in trouble, only ahead by a mere six points? Did they know they were going to have the kind of 4th quarter that only championship-caliber teams are capable of having in such a big game? Did the fans share the same emotional sentiment as they chanted along with the team from the hard, aluminum bleachers? By the 11-minute mark on the countdown clock, the lead had expanded to 34-22. The players embraced the audience, ushering in a seemingly premature celebration for the win. Perhaps it was I who was out of touch as a spectator and fan. Three consecutive turnovers for the Surge led to three quick touchdowns for the Elite, and suddenly, the game was out of reach with just under half a quarter still to play. I was mesmerized by the fierce, combative energy the Dallas Elite displayed once they had the game in hand. Their tenacity, in the midst of team struggles for much of the first three quarters, was inspiring. I was NOT just watching “football chicks” aspiring to be something they could never be. They WERE what they sought to be. They ARE what they say they are, and it is SO much more than a casual moniker. 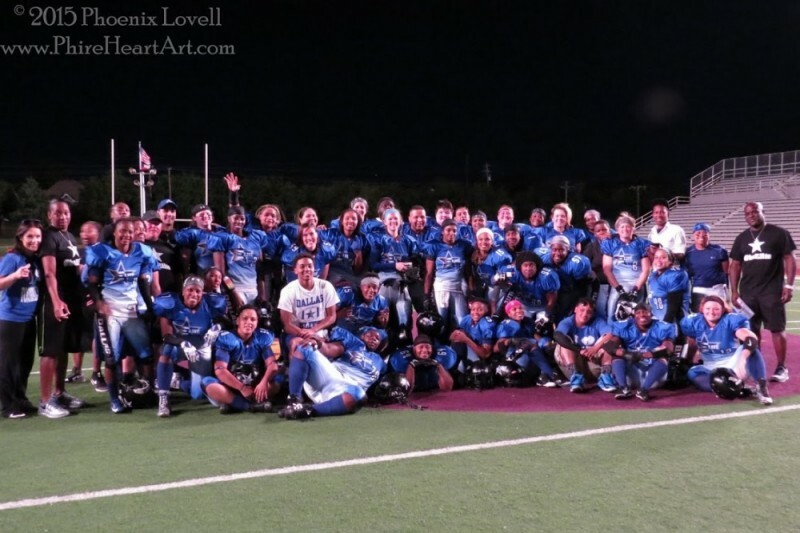 I rushed the field after the game, with the rest of the fans, to feel the elation and spirits of sweat, Gatorade and water, as the team excitedly celebrated their bid to fight for the 2015 League Championship. 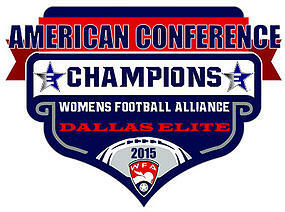 The Dallas Elite will head to Los Angeles to play the D.C. Divas for the National Title on August 8, 2015, at Los Angeles Southwest College. I forgot about all those fancy, typical football frills because the product I saw in Alfred J Loos Stadium that night was all that mattered. Football is football! Period. Alex Moore is a Sports Contributor at The Scoop.